Stiff criminal penalties and the risk of killing another driver usually cause most people to think twice before driving after they’ve been drinking. Drivers should feel the same reluctance when it comes to driving while drowsy. Sleepiness can diminish a driver’s performance behind the wheel as much or more than alcohol. According to a 2010 survey by the American Automobile Association (AAA), over 16 percent of all deadly traffic accidents and over 12 percent of crashes that require a driver or passenger to be hospitalized are due to drowsy driving. However, it’s now estimated that drowsy drivers are involved in approximately 21 percent of fatal crashes—a significant increase from the 2010 survey. The 2010 AAA survey also reported that 41 percent of drivers admitted they had fallen asleep at some point while driving a vehicle, and more than 25 percent admitted they had driven their vehicle when they were so tired, they could barely keep their eyes open. According to the National Highway Traffic Safety Administration (NHTSA), driver fatigue results in an estimated 1,550 fatalities, 71,000 injuries, and $12.5 billion in monetary losses each year. While fatigued driving is considered a form of negligence and drowsy drivers may be held liable for their actions, if you were injured by a drowsy driver, you’ll likely need the assistance of an experienced car accident attorney to help prove your case. Additionally, in a Sleep in America poll conducted by the National Sleep Foundation in 2000, 42 percent of drivers polled reported feeling stressed when driving while tired; 32 percent said they got impatient; and 12 percent admitted to driving faster. Most drowsy drivers aren't irresponsible or intentionally reckless. 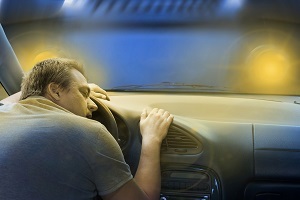 Any driver who doesn't get enough sleep can cause a serious automobile accident. The National Sleep Foundation's 2005 Sleep in America poll found similar results as the 2010 AAA survey: 60 percent of drivers (approximately 168 million people) reported having driven while sleepy during that year, and 37 percent (approximately 103 million people) admitted to having actually fallen asleep while driving. Additionally, people who drive for long periods of time, work inconsistent hours, take over-the-counter or prescription medications that increase drowsiness, have undiagnosed or untreated sleep disorders such as acute insomnia, sleep apnea, and narcolepsy are at a greater risk for falling asleep while driving. The accident happens in the late night, early morning, or mid-afternoon. Statistics show that most crashes or near misses happen between 4 - 6 a.m. Midnight - 2 a.m. and 2 - 4 p.m. are also peak times for fatigue-related accidents. The accident is usually serious. The accident typically involves a single vehicle that veers off the road. The crash happens on a high-speed, rural road. The driver makes no attempt to avoid the accident. The driver is usually alone in the vehicle. If you've been injured or had your vehicle damaged in an accident with a driver that you suspect was driving while drowsy, you need the representation of a skilled attorney who has experience handling fatigue-related crashes. Contact the dedicated and professional attorneys at the Inland Empire Law Group to discuss your case.